I arrived late on a pouring Wednesday night to John's apartment on the Upper West Side. Lori had informed me earlier that I may have some trouble getting into the building. But when I arrived with my wet umbrella, the security guard gave me a big smile and said "you must be here to see John. Go right up". There was a persistent smell of tobacco as the elevator rocked up to John's floor. When the door slid open enough for me to take in the room, I gasped. 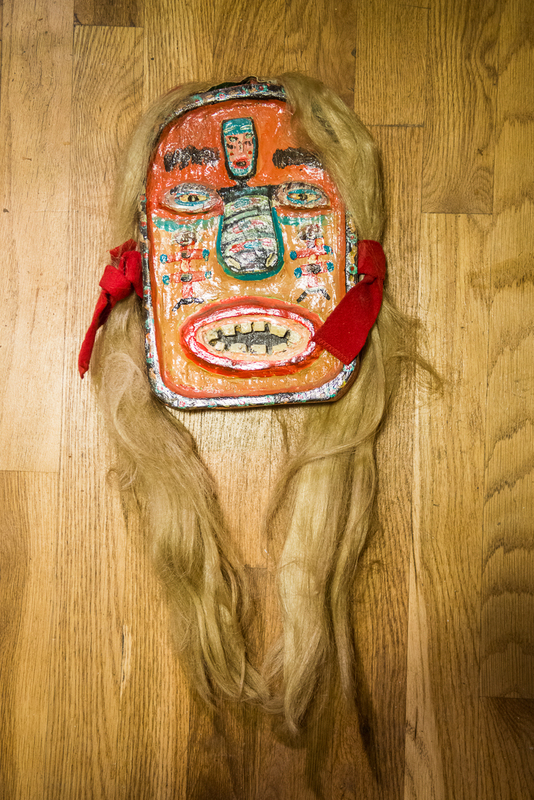 Every inch of the walls in John's apartment was covered in carved masks, ceramic masks with fake hair, his "Picasso" paintings, pop art paintings, glass bottles with masks and more. "20 years of work", John said proudly. “I hope you don’t mind, but I’m really nervous” he told me. He asked Lori to be present at our interview. Before our arrival, she had been the sole person allowed in the space. John’s prolific art making is obvious. For 20 years he has been hustling on the streets of New York, selling his art. “I want to make 6000 Picasso’s” he told me, “then my work is done!” Lori pipes in, “that’s why I call him the master. No one has that talent and hustles. No one makes that much work. This is only half, the rest are hidden in suitcases, packed away. Sometimes if you turn one of his works around, you’ll find that there’s another painting on the other side. This is how he works, he takes these paintings out and if they don’t sell, he’ll go and paint on the other side. So sometimes you get two for the price of one! I don’t know anyone who’s that prolific! No one!” John listens on, bashful but full of pride. “I work real hard”. When I asked John where he grew up, he responded with “mainly around Hells Kitchen”. A self taught artist who started painting at the age of 30, John cites comics and his imagination as his main influence. Stickers with his batman drawings can be sighted in various locations around New York City. One of John’s masks catches my eye. “I made this for my wife”. The halo of yellow hair extensions provides a wonderful cover for the square ceramic base. Whatever John paints or creates come from whimsical and sometimes dark thoughts in his head. “See this next one I’m working on, see the teeth in the mouth? I have a dentist that gives me all the teeth I need” he tells me proudly. When we talked about the therapeutic value of getting thoughts out into real form, John is matter of fact. “I just like to keep busy. This stuff keeps me busy for so many hours.” His typical work day starts from 6 at night and continues till dawn. John met Lori over 10 years ago, when he was selling on the street. She sought out his work over the years and approached him when she started The Stand. He describes Lori as his sister and has a sense of camaraderie towards the other artists at The Stand. 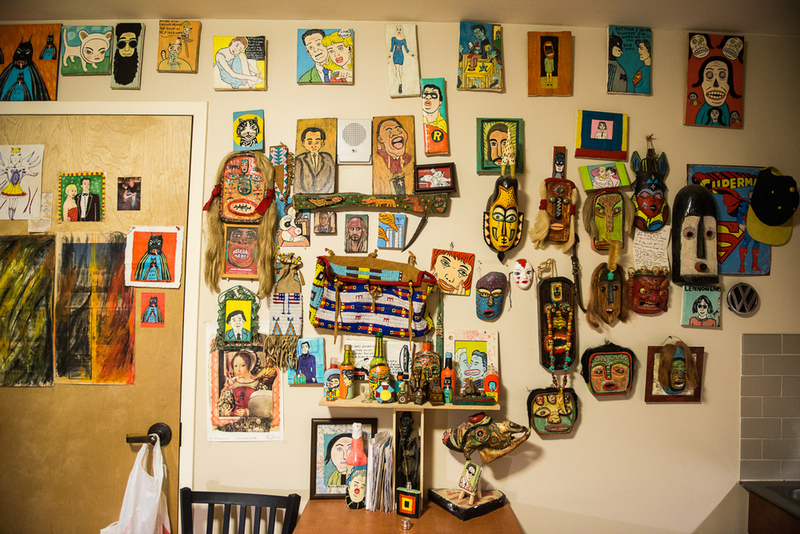 John points to several works in his apartment by Louis and Deb, works that he has exchanged with his own. Over the years, John has amassed some loyal collectors, one of whom has over 300 pieces of his work. Another, Lori tells me, is the cartoonist R. Crumb, who supposedly included several of John’s paintings in his contribution to the National Gallery in Washington. On warmer days, John can be found at his usual spot on 23rd Street between 8th and 9th Avenues.